Today, this post does not have any food, or recipe, any review on it. As it goes, it has fewer words than I normally write as well. What it does have, is a few of my favourite things. What it does have, a peek into who I am. A girl who loves to eat. A girl who loves to write. A girl, who loves nothing more than a bottle of Nutella, feet up, and Supernatural/FRIENDS/Masterchef/Top Chef on the TV. A girl whose life revolves around MS Excel, and is darn good at it. A girl who LOVES to bake for her friends and family. A girl who is extremely excited about starting a new life with her best friend and her soulmate. A girl who will go to the end of the world for her Ma and Baba. A girl who will win any Harry Potter trivia knowledge in her sleep. A girl who has found a baby sister in her soon-to-be sister-in-law. A girl who loves taking photos, because you never know what may happen tomorrow. A girl whose grandmother is her sister, her friend, her sous chef, her teacher, her student and her life. A girl who's madly in love with Jensen Ackles. Google him, you won't regret it. Thank me later. A girl who watches Andaz Apna Apna every time on TV, and now knows the lines by heart. A girl whose best-friend-turned-soulmate-turned-fiance is her Andaz Apna Apna partner. A girl who thinks Red Mango froyo is REALLY expensive. A girl who will fight to death for women's rights and gay rights. A girl who loves everything to do with chocolate. A girl whose best-friend-turned-soulmate-turned-fiance is the joy and pride of her life. A girl who will lick the screen when Avengers is on Star Movies, because Chris Hemworth and Chris Evans are really that hot. A girl who has found her best friends on Indiblogeshwaris. A girl who has her phone on charging the whole day because she can't stop browsing Pinterest. A girl who remembers that time when her Baba picked her up and flew her on his arms. A girl who tries to eat healthy, kinda succeeds but binges on a pizza once in a while. A girl who, if she does not tell her Ma every little detail of her day, feels physically ill.
A girl who has a wicked collection of rings (and shoes and bags). #SorryNotSorry. A girl who will forever be her Ma and Baba's little baby, because that is what I really am. A girl who'll forever be the granddaughter who learnt baking from her Grandmother, because that is what I really am. A girl who is always reminded by a mad boy, how lucky he is to have her, because that's how lucky I really am. 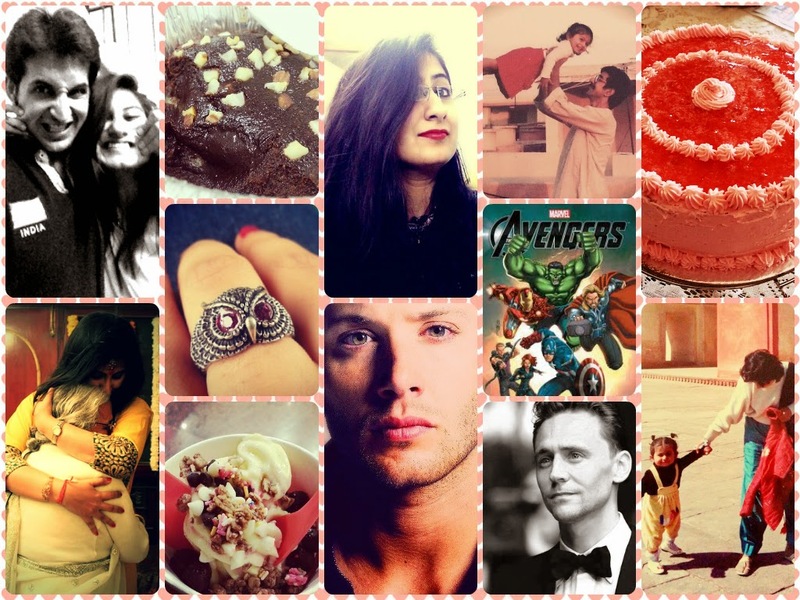 I am Aishwarya, the geeky girl who bakes, eats, reads, watches TV, pins, loves and is loved. And I'm so proud of me. Beautiful! Girl you do fabulous things :). Ahh you're a Supernatural fangirl too? And Andaz Apna Apna? And Nutella? Are we sisters? Iss janam na nahi toh pichle janam mein toh for sure! Ayyeee Pooju! Thanks for reading! Oh goody! Thanks for reading! actually read every word! :) superr amazing! This is good stuff..you've had me hooked.. Line and sinker on a sickie. Hey! The apple cinnamon jam shall be put up soon! Thanks for reading!